I’m going to start with the expo. The expo was great! I wish I could have gone the first day so that I could have gotten a couple shirts I really wanted but by the time I got there Saturday afternoon, they no longer had them in my size. 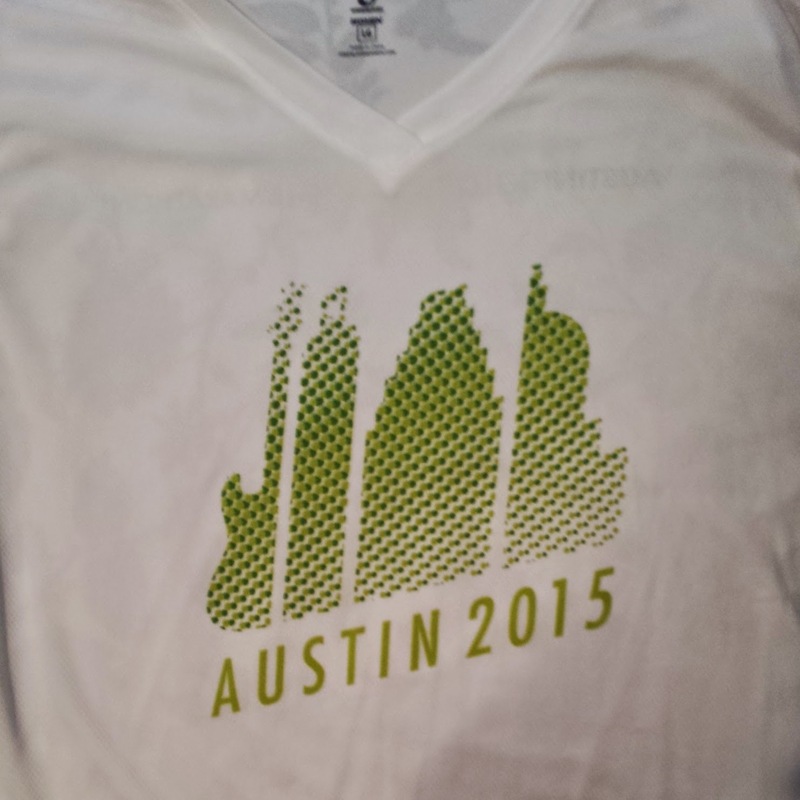 I did score 2 Austin Marathon vendor shirts that I like very much. When I was walking into the events center where the expo was held, I saw people leaving, carrying their gear check bag with their participant shirt in it. It was bright orange. When I saw that, my initial reaction was, ugh, ugly! So, when I got to the back to pick up my packet and I unfolded my shirt and looked at it…I changed my mind. I did like it after all. The half marathon shirt was a dark blue with the same design on the front, it just said “half marathon” instead of “marathon” on the back of the shirt. I have to say that, since the design on the front was mostly in different shades of blue, that I didn’t like it so much on the half marathon shirt. 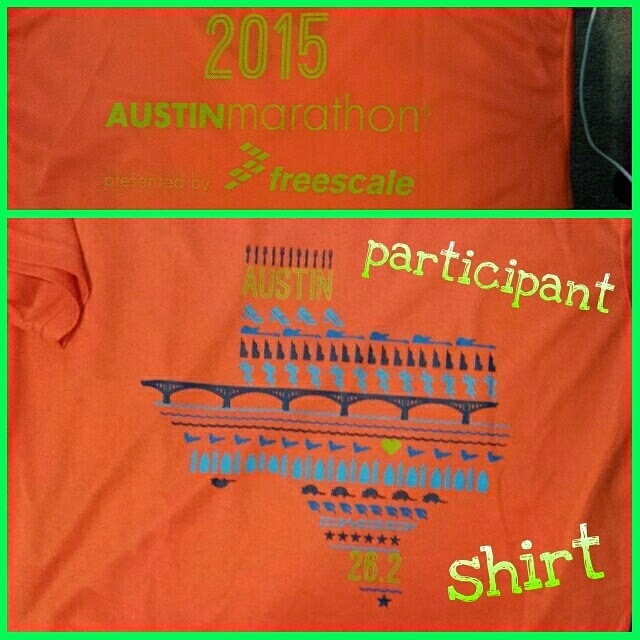 I like it much better on the bright orange marathon shirt. The contrast just looks better to me. 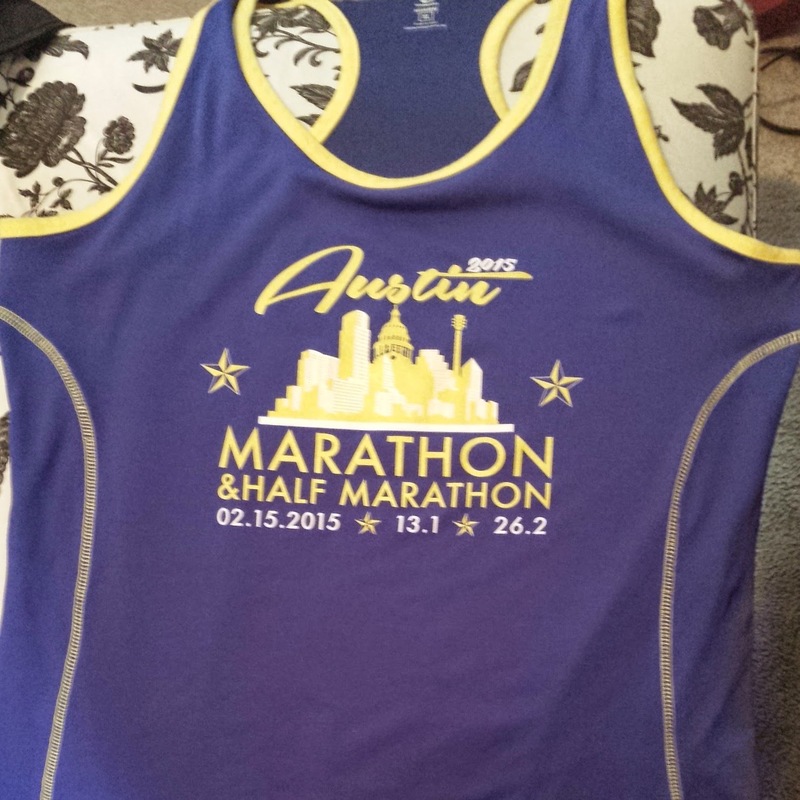 The half marathon shirt was, well, bland since it was all just different shades of blue. 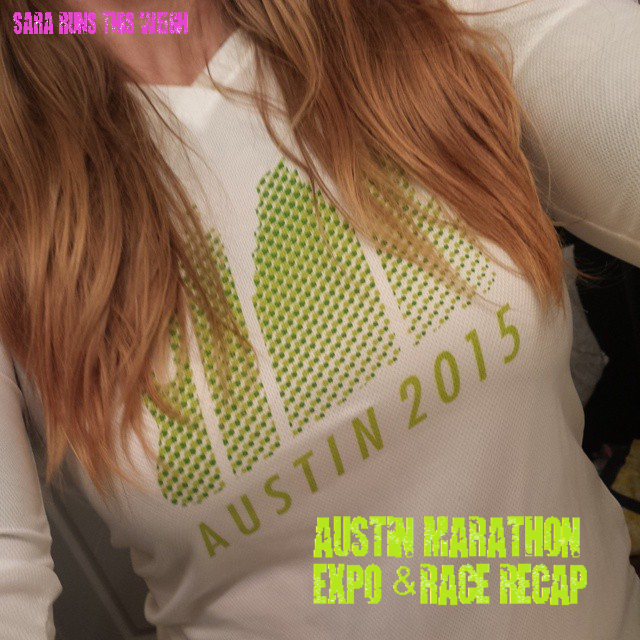 Oh and there was also like neon green on the marathon shirt. 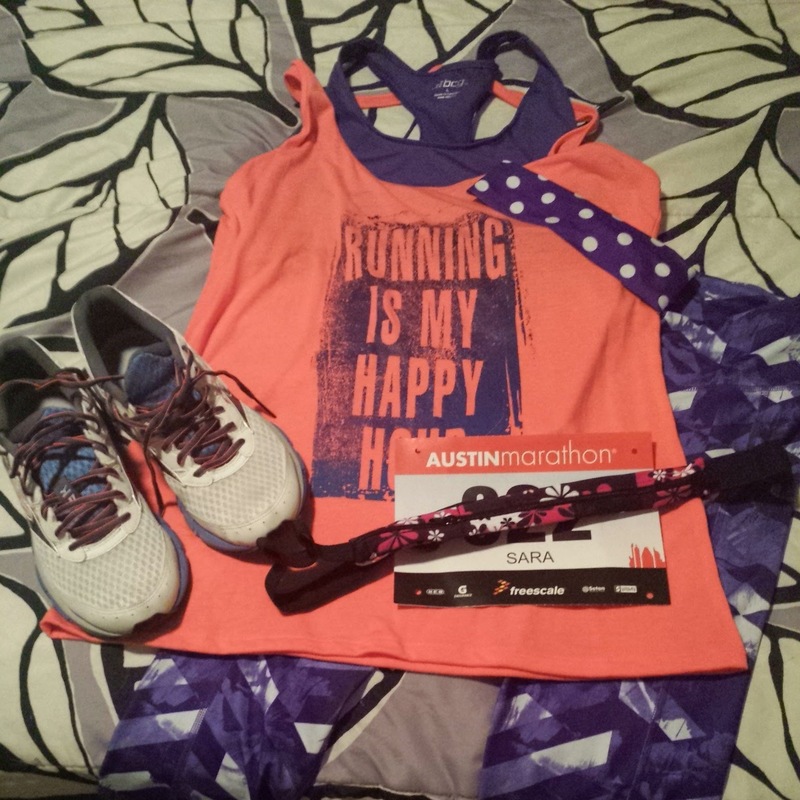 On top of the shirts I bought, I also bought 2 more of my favorite Hippie Runner gear belts and a bunch of gels. They had this gel, huma, that I’ve never tried before. It has chia seeds in it. So I got one of every flavor to try later. Nothing new on race day, so the saying goes. I’ll try them on training runs. 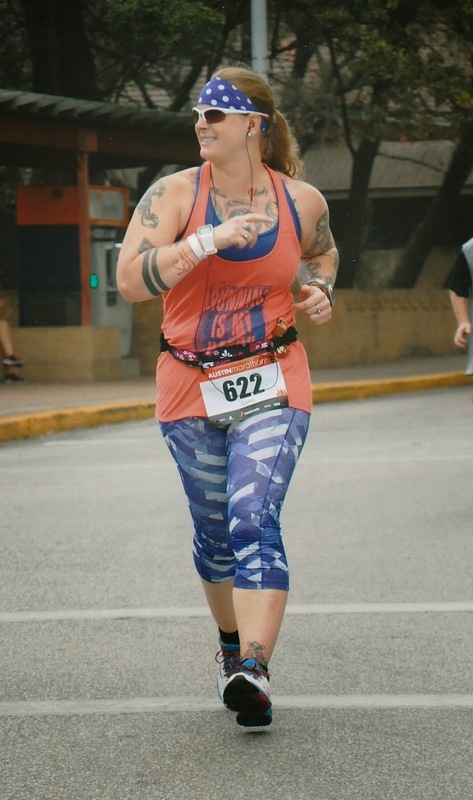 The shirts I wanted to get but was unable to get them in my size, one was a purple tank with pink piping that had an outline of the Texas state capitol dome with “come and run it” underneath it. The other was just a short sleeved version of the white one I did get. My day before race food consisted of meeting a friend at Olive Garden for lunch where I had risotto balls with marinara sauce, shrimp alfredo, salad, and apple bread pudding. MMMM! It was so good! For dinner, I had a taco salad from a little mom and pop Mexican restaurant. I said it after the Dallas Marathon and I’m going to say it again now, shrimp alfredo is my go-to day before a marathon meal. It might not be a good idea for you, but it works for me and that’s what matters. You gotta find out what works for you and then stick with that. On to race day! I woke up around 5am. I had already gotten everything I would need for race morning ready and put together the night before. So, all I had to do was get dressed, grab my stuff, and drive to where I was going to park. Since the race started in downtown Austin and I work in downtown Austin, I just parked in the parking garage for my work. YAY! Free and hassle free parking! It was about an 8 block walk from the garage to the start line. I missed a text from my running friend, Rob, to meet up before the race started. A little bummed about that. I would have really liked to have gotten a pic of us together and for him to take a pic of me in my outfit for the day. Oh well. We will run the same races in the future again, so we’ll have other chances. Another running friend of mine, Kirsten, is a member of the local Rogue Running group. 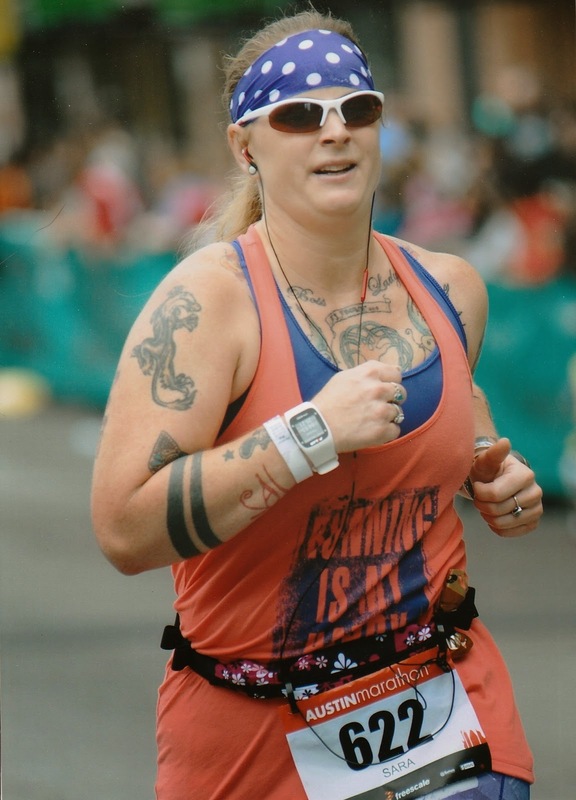 She had access to a pace chart calculator that was customized specifically to the Austin Marathon course. She plugged in my goal pace for the race (11:15 min/mi) and it generated split times for the whole race, everywhere from a slow starting pace of 12:15 per mile down to 10:30 per mile during the downhill miles. It all averaged out to 11:15 per mile if followed exactly. I did my best to follow it as precisely as I could. I did start running a little faster than the chart called for during a few miles just before the halfway mark because I realized I was going to have to stop and use a port-a-potty. 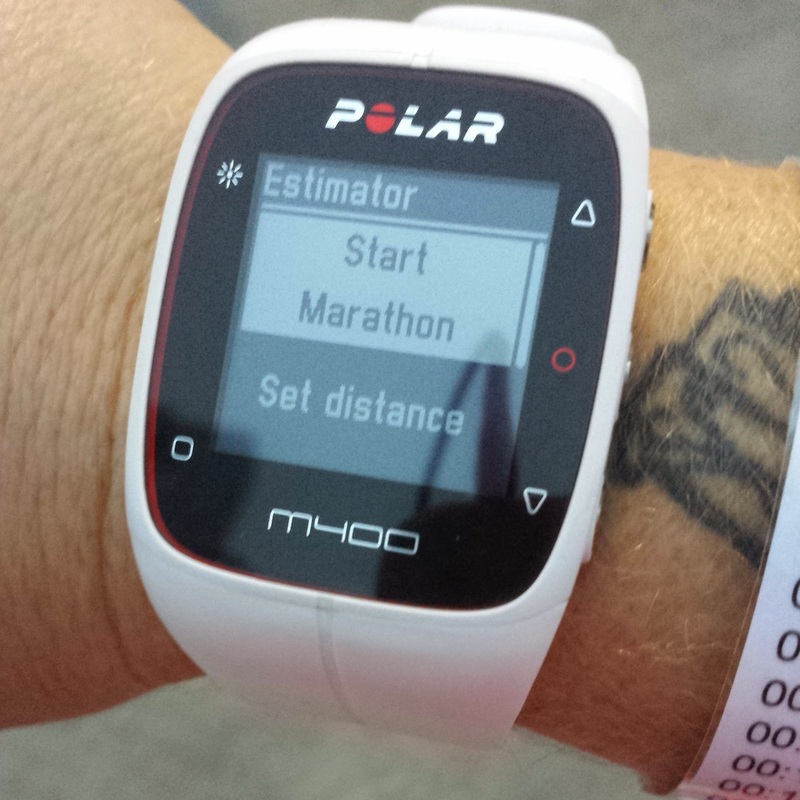 I wanted to make sure that I had time to use the restroom and not mess with my goal finish time. I succeeded in putting enough time in what I started calling the “bathroom bank.” Haha! It was a little humid to start, but after I got running, the wind picked up a little bit and the humidity didn’t bother me at all after that. Also, my left knee had been hurting for a couple days. I’m guessing it was my bursa because it just started hurting randomly when I was just sitting down at work. The same thing happened when the bursa in my right hip got all inflamed a while back. But, as soon as I started running, the pain in my knee went away and stayed away. One of my coworkers joked that my knee started hurting BECAUSE I was just sitting down…it wanted to be running! HA! I like that. At the halfway point, shortly after I used the port-a-potty (oh and opened the door to some guy using the bathroom because he forgot to lock it), a friend from work was on the sidewalk waiting for his wife who was also running the marathon, so I ran up to him and got me a high five and a little pick-me-up because I saw a familiar, smiling face. Let me back up a little bit to around mile 6, I think. It was the first real hill of the course. It’s where Cesar Chavez meets up with Lake Austin Blvd. It definitely doesn’t look like much at first glance, but then you try to run up it and it catches you completely off guard and it did just that to me and it slowed me down a lot more than I thought it would. So I had to pick up the pace as we ran down Lake Austin Blvd. When we turned onto Enfield, we went up a couple more hills, but I didn’t let those ones catch me off guard. I held my pace steady and checked my Garmin for my pace frequently as I powered up the hill, breathing mindfully the whole way up. I really liked running through the neighborhoods. The residents were amazing and super supportive. A lot of them had little tables set out with oranges, cookies, pretzels, water, beer, mimosas, and all sorts of fun stuff on them. They had fun signs and cowbells and clappy things and other noise makers. One resident had set up sprinklers for the runners to run through at the curb in front of their house. Kids were lined up along the side of the street for high fives. I made sure to get a lot of those. I’m not a kid person, but I LOVE getting high fives from kids when I run races! Also, I got a high five from a dog as we ran up S. 1st St, near Oltorf St.
• don’t be a Seahawk, run it! There were a few others that were really good, but apparently I can only be expected to remember the wording of 5 different signs. Ha! If I had been running with my phone in my hand, I could have taken a picture of all the signs I thought were really funny. But, I don’t like running with anything in my hand. The water stops were well spaced and right when I would start thinking “man, I could sure use a drink of water,” there would be a water stop right around the next turn. It was great, you could always tell there was about to be a water stop because they’d have one of those blue kiddie pools with a sign that had a downward pointing arrow on it that said “wrapper drop” so that there was less course clean up needed. The volunteers along the course were great! They were hollering out words of encouragement the whole time you were running past them. They were all very positive and happy to be there. And let me tell you, there is just something to be said about having your name printed on your bib. You run past people and they yell out “great job, Sara!” and the like. It’s very motivating. Because of my whole “padding the bathroom bank” before mile 13 where I ran a couple/few miles faster than the pace chart said to, I think I hit a little tiny bit of a wall around miles 17 and 18. Those were right in the thick of a course of 11:15 paced miles. I remember thinking, “how am I going to go any faster than this?” However, when the time came a couple miles later to pick up the pace, it was no problem. In fact, I had keep forcing myself to slow down because I was going TOO FAST! Every mile or so, the pace would drop according to my chart and I would run faster and faster. I finished strong…very strong. 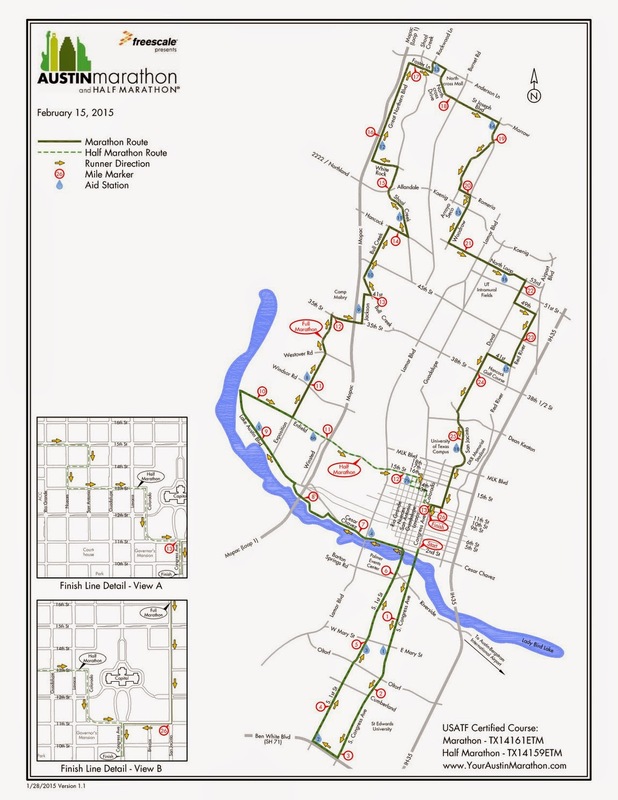 Just before the finish, the course went through the University of Texas at Austin campus. There was a long line of UT students in the school color (burnt orange) t-shirts with “RUN!” screen printed on them. They all stuck their hands out and I high fived almost all of them! They were very enthusiastic and motivating. When I crossed the finish line, they called my name out over the PA system! I love it whenever they give me a shout out at the finish line. Once I crossed and stopped both my Garmin and my m400, I started looking for the people with the medals. They were actually quite far away from the finish line, it surprised me. For a brief moment I actually thought that the medal people weren't there and that I wasn't going to get my medal. Then, I found them! I got my medal and I love it! I finished in 4:56:00, according to my Garmin. 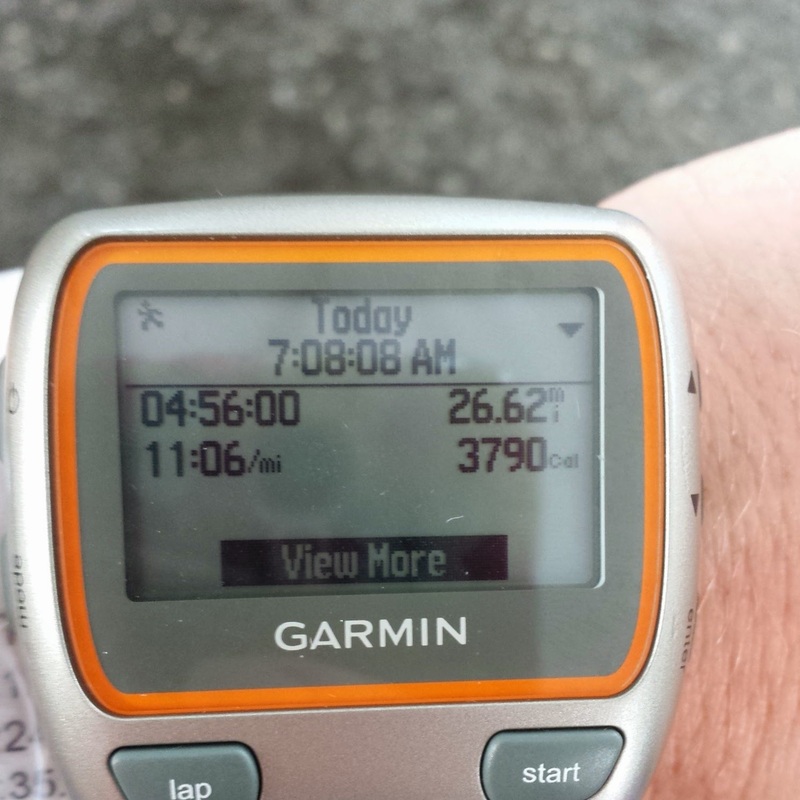 My Garmin logged me at 26.6 miles (my m400 logged me at 26.3 miles) so that gave me an average split time of 11:06 per mile. 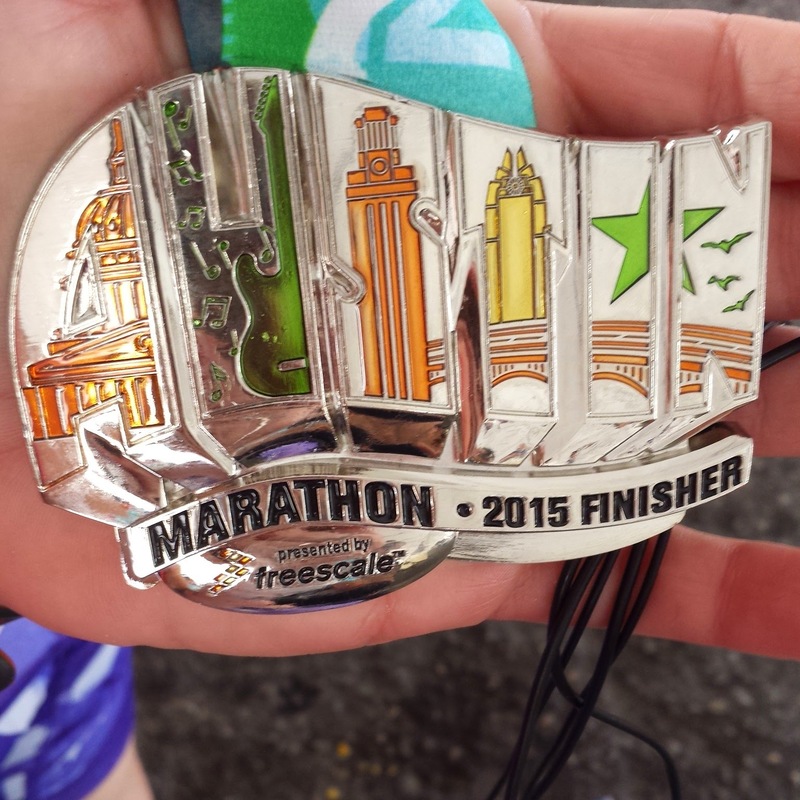 But, that same 4:56:00 per the Austin Marathon gave me an average split time of 11:18 per mile. Either way, it was a great time and I am very happy with it. 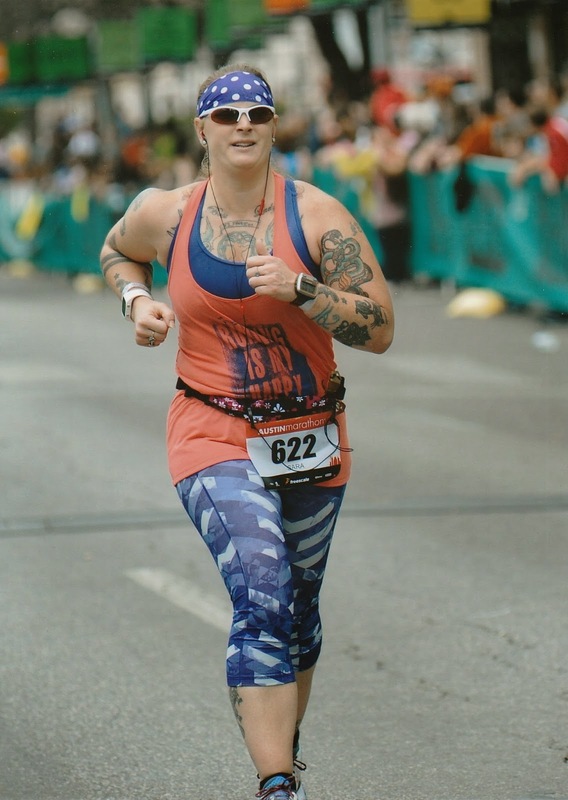 I honestly couldn’t be more happy with my performance at the Austin Marathon. After I made my way through the finisher’s area and had collected my bottled water, my blueberry bagel, my granola bars, and my bag of jalapeno queso potato chips, I made a beeline for the massage tent. You know how most races will have a free 5-minute massage tent, well, this wasn’t a free massage tent. These were 10, 20, or 30 minutes massages. The 10 minute was $20, the 20 minute was $30 and the 30 minutes was $40. I had $30 with me so guess what I got. It was amazing. As I sat in the tent waiting my turn on one of the massage tables, my leg muscles did start to get really stiff, but by the time the lady was done with my legs, they felt great. 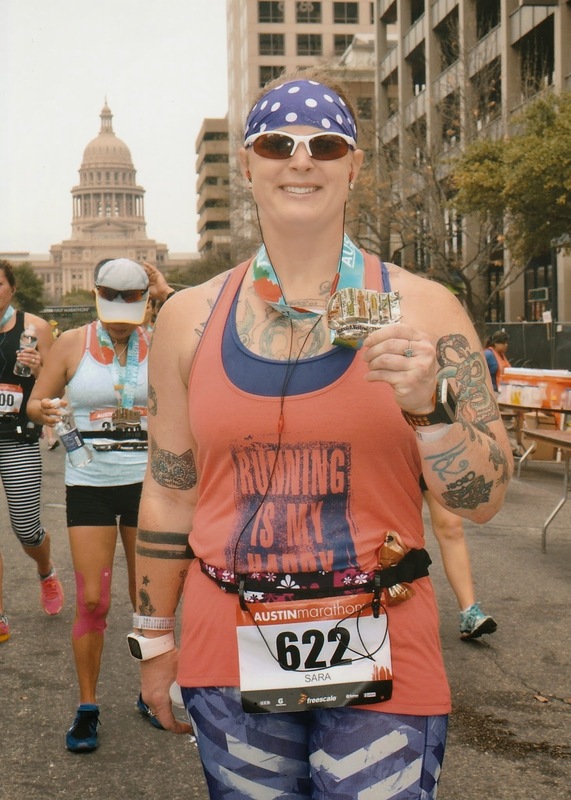 After I got home, I found out that the Austin Marathon course is one of the toughest city race courses in the entire US. This made me even MORE happy with my performance. 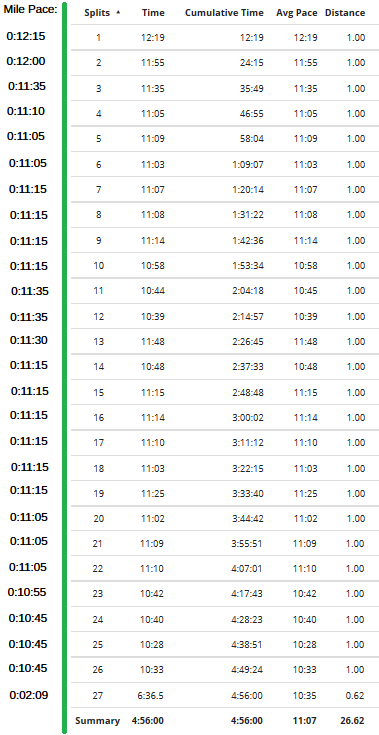 Here is the pace chart that Kirsten provided me with followed by the splits from my Garmin. CONGRATS!!! That is so awesome!! I'm not a runner at all so doing 26+ miles in less than 5 hours is crazy impressive!! Congratulations on such a great race! Austin is TOUGH. My husband has done the half a couple of times, but I'm not even tempted. You rocked it! Also, thanks for explaining how the pace band works - I've seen them for years but the way you described how to use it is the first time it's made sense to me.